For #librariesweek, a few books about books. Because we are living in a time of library cuts, librarian redundancies, and struggling independent booksellers, children’s authors are doing more and more to celebrate not only their nostalgia for the old days of libraries, but also a burgeoning belief that they must fight to uphold every child’s right to library access in the here and now. This is a reassuring book for those readers who haven’t quite grasped the fundamentals yet, or who are struggling with their confidence. Madeline does not like to read, especially out loud, for fear of humiliation and ridicule, but she really wants to earn a star at school rather than just a ‘keep trying’ sticker. She does have a great role model in her mother, who takes her to the library, and keeps her supplied with an abundant pile of books. When the librarian suggests that Madeline read out loud to a dog, rather than a human, Madeline begins to see the merit in trying, and before long her reading abilities have caught up with her ambition. Inspired by real-life programmes of incentivising children to read with ‘Read-to-Dogs’ sessions in order to build readers’ confidence, this is a worthy and also admirable little read. The book deserves a mention, not only for the quality of the storytelling, but also for the clear, well-spaced text against a cream-tinted background, which provides an ease on the eye for emerging readers. The illustrations are fitting – soft, expressive, and with a winsome collection of scenes from Madeline’s life – from riding her bike, to struggling over her books, to swinging in the garden, and staring out the window, all with an ever-present favourite soft toy. It creates a rounded picture of Madeline, perfect for empathy. The dogs are all cute and fluffy, or sleek and loyal, and delighted my listeners with the several different breeds depicted, and the dogs’ loving, attentive eyes. You can buy it here. Jen Campbell takes her bookish book one step further, with a dragon protagonist who loves to read aloud. Perhaps he needs a dog, for this dragon can find no one to read to (the people he encounters run away in fear). Then he meets an inquisitive book-loving girl called Luna, who isn’t afraid because she has read about dragons in books, and so they come up with a plan to enable the sharing of books as widely as possible – a flying bookshop on top of a dragon. If the concept sounds a little strange, it is – but it fits with the quirky whimsy of this book, which uses the bulk of its prose to extort the virtues of reading (expanding knowledge and extending imagination) by creating a higgledy piggedly mix of what the dragon and the girl bump into within the books in their reading sessions, from roller skating and King Arthur to kung fu and pirates, carol singing and anteaters. This is quite literally drawn out in Katie Harnett’s illustrations of ant-eaters juggling, kungfu bats and mice moving furniture. The illustrations feel dreamy and timeless, with pencil colouring textures and shading and painstaking patterning – particularly the horseshoes on the dragon’s green skin. The book speaks to unusual friendships, accepting others who may have only kind intentions despite threatening appearances, and the power of books. You can purchase it here. This Luna is more than just a girl who loves the library. She has a special reason for loving the library, and it’s because her Dad waits for her there, and together they explore the books. Although not explicitly stated, Luna’s mother and father are separated and so this is the time she spends with her father. In a story within the story, (a physical inset), a not-so-hidden metaphor for Luna’s family situation, the enduring love for a child is explored using trolls and mermaids, despite the splitting of the family unit. So, of course this is a book about dealing with family breakup, and yet it will appeal to all, for its illustrations are warm, affectionate, colourful and brimming with life and imagination. Lumbers depicts the library books coming to life – with vines sprouting from one book, bugs from another, and magic tricks busting from a magic book. More than this though, is the attention to detail in the depiction of the library: the clever welcoming posters in the foyer, the comfortable chairs, the abundance of books, and the set up, which shows a spacious, well-lit modern library with a self-checkout. Lumbers and Coelho are at pains to depict not a fanciful idealisation of libraries and family life, but a confrontation of where we are and how we can still find happiness and hope within it. (Although I wish my local library was as well-lit and stocked). Lastly, and by no means least, are the people depicted within the book. Lumbers and Coelho tick all boxes here, both the diverse mix of people using the library, but also in the comfort and ease of the body language – the children flopped over chairs, or tucked up tight, others with legs akimbo, hair wild and smiley faces. But the best – the armchair hug with Dad. You can almost feel it. You can buy it here. Another new novel for children (aged approx nine years and over) that seeks to explore an immensely difficult political reality, but without making it too complicated for children to understand or too upsetting to read. Instead, it uses adventure and ongoing hope in the face of extreme adversity. Tash lives in Tibet, where her father works for the resistance in an attempt to keep his supressed religion alive, and to get word out to the wider world about the oppression of the Tibetan people by the Chinese occupation. When a man sets fire to himself in the village as an act of protest, the Chinese soldiers step up their curfews and subjugation. Tash’s parents are taken away, so she sets off across the Himalayas to India in search of help from the exiled Dalai Lama. The majority of the book tells the account of her trek across the mountains with her friend Sam, and two yaks. What makes the book work is that this is a depiction of an ordinary child in extraordinary circumstances. At the beginning of the novel she is shown attending school, and yet she can’t run home through the fields as she’d like because the patrolling soldiers don’t allow it. The emotions and thoughts are those of a child, with hurts, guilts and worries explored, but all the time there are small nuggets that lead the reader to believe that being small doesn’t mean that you can’t make a difference. The prose is simple too. Short sharp sentences in short sharp chapters, with distinct character development as Tash moves across the mountains. This gives the character a clear sense of purpose, but also makes the book a swift quick read, as if the reader too is running from danger. It also lowers the age range accessibility – meaning that a young confident reader can tackle the book because the vocabulary and sentence structures are kept easy and tight. However, in its brevity, the book glosses over some of the implausibility of the journey, and the action feels a little lacking in overall cohesion – almost as if the journey dominates the overall purpose – but for children this could be read less as a flaw and more as simply a sign of a pacey read. As with many novels for children, there is a very positive, yet dependent relationship between child and animal, (in place of family), and so the yaks become very much characters on whom the children are reliant, and so for whom the readers feel passion. There is also a huge emphasis on friendship, loyalty and courage. And lastly, the production of the book is simply stunning. With a cover that sings of sunrise and adventure, and inside pages that hold intricate print designs and hidden yaks, this is a beautiful book to own. An eye-opening and somewhat different read. Buy yours here. Warning, this review contains spoilers. They say write what you know. Canadian paediatric oncologist Alex Lyttle has certainly done that, but From Ant to Eagle is about much more than childhood cancer. It’s a tale of sibling love, and the healing power of friendship. Eleven-year-old Calvin Sinclair is bored. It’s the summer before sixth grade, and his parents have moved from big city to a small town, leaving him with no local friends, and only his six-year-old brother Sammy to play with. To alleviate his boredom, and to express his sibling dominance, Cal comes up with a series of tests for his brother to pass in order to move up the various levels of a made-up chart – battling from lowly Ant through to the awesome Eagle Level, where Cal sits. The chart is meaningless, of course, and Cal hasn’t done anything to deserve Eagle Level, it’s just a simple display of power. The tests include everything from shooting hoops to disturbing a wasp nest. Then Cal meets Aleta, a girl of his own age who is also new to the area, and the two of them go off on day long adventures, leaving Sammy at home. Cal gives Sammy a series of tasks to complete in his absence. As the summer progresses, so does Cal’s friendship with Aleta, but also Sammy’s number of sick days. From being unable to keep up with Cal and Aleta on a bike ride, suddenly Sammy is too ill to stray far from the house. When a collapse at school leads to a serious diagnosis, Cal has to re-evaluate whether he himself passes the test of decent big brother; does he himself even deserve the status of Eagle Level, or were the challenges he set Sammy essentially mean-spirited? For now, with a series of real tests in the hospital, Sammy has to show true bravery. The text is beautifully readable, and the setting highly visual – from the countryside Cal and Aleta explore, to the contrasting confines of the hospital. But the main focus of the book is the sibling relationship – Cal’s feelings of annoyance at his little brother quickly turn into guilt when Sammy gets sick, but also love and protection…something that’s actually been there all along. As well as this, the reader sees how much Sammy looks up to Cal too – something that Cal comes to recognise through gradual self-awareness. Cal’s voice is honest and direct, which at times of course, is brutal in its direct confrontation of a fatal illness, but also incredibly moving. And through this honesty, the book is admirably empathetic of all characters – doctor, parents, patients and siblings. There are some lovely touches – a fascination with the Goosebumps series of books, as well as the emotional understanding displayed by Cal in gaining the trust and friendship of new girl Aleta. This book isn’t for everyone – with intensely adult themes, including the death of a six year old, this will be a hard book for some to swallow – yet it’s so honestly written, so tender, that for those willing to confront life’s darker side, it deserves a wide audience. For 10+ years. Please note that this book was initially published by Central Avenue Publishing in North America, and may not be as widely distributed (yet) in the UK. It is, of course, available on Amazon. It was with some trepidation that I started reading this novel, advertised for young teens, but I think appropriate for mature nine year olds, because of Laird’s introduction. The novel begins with a foreword from the author, which gives an explanation of why the war in Syria began and poses a question at the end about how history will judge our treatment of refugees. Literature is there to pose questions and make us think, as well as imbue empathy. And good literature should teach us things too – but above all there needs to be a good story well told, otherwise readers won’t get to the crux of the book. Elizabeth Laird is an experienced writer, and has written many great, distinguished and prize-winning novels. Is this more than just another ‘issue’ book, a book that has written a story around an issue, rather than starting with a story and drawing an issue out of it? This isn’t Laird’s best book in my opinion, and yet this is way more than an issue book, and it certainly makes the reader think, and so it deserves this week’s book of the week spot. Twelve-year-old Omar narrates the story – in past tense. He lives in Bosra, isn’t keen on school, but makes money selling postcards at a tourist site. His father also works in tourism – but for the government. When war breaks out, the family’s troubles grow – not least because Omar’s father has to move for work, but also because his older sister is being married off (having reached the marriageable age of sixteen). Omar’s older brother Musa suffers from cerebral palsy and starts getting in with a group who are anti-government. It’s a complicated situation and Laird does her best to navigate through the family’s journey. As the bombs fall on the city, they move again, and again, until eventually they have to flee Syria completely and cross the border to a refugee camp in Jordan. Laird has done her research – she has spent time in the refugee camps and has prior knowledge of living in the Middle East as well as a presenting us with a hefty acknowledgements section that clearly names all the various experts and refugee families who have helped to share their experiences with her. It’s not a short novel, coming in at over 360 pages in the proof copy, and is fast-paced and hugely enjoyable. Yet, even at this length, it still feels like a skeletal piece. The descriptions of places are somewhat lacking – particularly the urban settings, although there are glimpses of what was once there – the tourist areas boomed, and the ordinary society was buzzy and lively – and yet there wasn’t quite enough description to give that emotional evocation of what has been lost. The secondary characters too – Omar’s sister is desperate to stay a scholar and not get married, Omar’s brother struggles with his illness that sets him apart as different (just as any boy would anywhere in the world), but neither are portrayed in enough depth to give complexity to their issues. However, other relationships do spring from the page – Omar’s mother’s relationship with her grandmother, and likewise her relationship with her sister – these feel alive and real – with just a light touch. Omar – our protagonist – is likeable despite having many flaws; he comes across as real – that awkward age of boyhood into adulthood that’s particularly difficult to navigate at the best of times, let alone in wartime, and when he’s dealing with an absent father and a physically weaker older brother. Written from a very British perspective, the language used will be vastly familiar to the Western reader – words such as ‘bungling’ and phrases such as ‘ratting on someone’ and ‘I beg your pardon’. Perhaps this is on purpose, to make the readership feel familiar with the family portrayed – to show the readership here that this is something that could happen to anyone. And yet, as with the lack of physical description of Syria, it takes away some of the authenticity of the book. But overall this book ticks the boxes for me because it’s gripping and fast (the book sprints through the plot) and portrays the Syrian war and the refugee crisis so that an average ten year old in this country could gain some insight and experience some empathy. The book extols the virtues of bravery and hopefulness. Of learning to look out for your family and put someone else first. And it makes you think – how will we welcome a family such as Omar’s in our country? Who are these people? Are they just like you and me? You can buy it here. Fifty pence per copy of the hardback book sold will be donated to an international aid agency supporting the Syrian refugee crisis. There’s an enduring reality that women are underrepresented in fields of science, technology, engineering and maths (STEM) globally. For example, just 28 per cent of science researchers are women. According to the Wise Campaign, the number of girls doing STEM subjects at GCSE is approaching an equal number to boys, but drops off at A Level, although those that do, tend to achieve higher grades, and the numbers are rising. In the professions though, there is still work to do – only one in ten STEM managers were female in 2014, and women only make up approx. 13 per cent of STEM occupations in the UK. Rosie Revere Engineer has been a staple in the primary school library since publication in 2013, with charming Rosie, a quiet girl who turns into a brilliant inventor, and dreams of engineering. 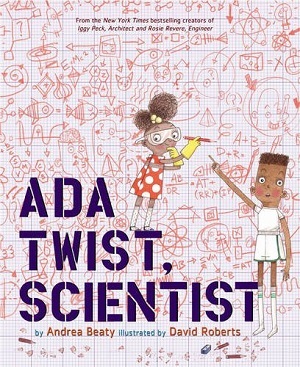 Ada Twist, Scientist capitalises on Rosie’s success, (we girls working together!) but Ada is a winning tale in its own right. The character ‘Ada Marie Twist’ is named after Ada Lovelace and Marie Curie, explains Andrea Beaty, and demonstrates the same glee as Rosie in asking the question ‘why’, and setting out to discover the answer. “She started with Why? and then What? How? And When? The questions are so many that they fly off into the illustrations, which become more and more complex and intricate, mirroring Ada’s mind – which is clearly filled with the clutter of questions…and yet there is a preciseness in the detail – from the machines that Ada gathers to investigate, to the equipment that she uses for her experiments. Ada fixes on solving the problem of a particular smell, and her curiosity leads her parents to despair. By the end though, they too, and her classmates, are helping her investigations. Of course, the less than subtle message, for both Ada’s parents and the reader, is that curiosity fuels science, and that anyone can be a scientist if they are curious about the world around them – from the smallest smell to the biggest Why. Questions inevitably lead to questions. There are some lovely touches. Andrea Beaty plays with the modern parenting ‘punishment’ of the Thinking Chair – exploring the idea that thinking is a great thing to sit and do. Roberts’ illustrations also add zing to the book – from the incredible detail of each drawing to the parents’ use of books for investigations, the diversity of Ada and her family and also of her classmates, Ada’s mother’s incredible sense of fashion style, and the ageing of Ada both in the illustrative depiction of her, but also in her questions. It’s fun, informative, inspirational and a beautiful companion to Rosie. Age six years and over. You can buy it here. Too often biographies tend to serve older children. This marvellous piece of non-fiction is astoundingly brilliant for many reasons. It is accessible, bright, colourful, informative and quirky – making it interesting fodder for all readers. Not just focussing on science here, this is a book that explores women who have made a difference through their startling achievements in all fields. 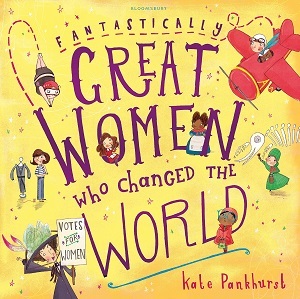 Written and illustrated by Kate Pankhurst – yes, Emmeline’s descendant, who features in the book, Kate also features some lesser known female pioneers, including Marie Chilver, a secret agent during World War Two, Mexican artist Frida Kahlo, and Channel swimmer Gertrude Ederle, as well as curriculum staples such as Mary Anning, Marie Curie, Mary Seacole and Rosa Parks. However, this is far from a dry documentation of their achievements. Each woman is attributed a double page spread, in which Pankhurst illuminates not only who they are and what they achieved, but also quirky facts and attitudes towards them at the time. Text is in small bite size paragraphs in designs that suit the person, such as in small smoke and speech bubbles for Marie Curie, in fossil shell shapes for Mary Anning, and in clouds for Amelia Earhart. There are also bright bold cartoon-like illustrations, again suiting each illustration to the character Pankhurst is describing – loops and swirls for Coco Chanel’s patterns, to cartoon interpretations of Kahlo’s paintings. It’s fun, immensely readable and completely enjoyable. It’s an eclectic mix, but interesting that the selection is not only global but pulls the women from completely different backgrounds and upbringings, as well as timescales. A must-have for all school libraries, but an equally inspirational and aspirational book to have at home for all girls and boys! Age six years and over. You can buy it here. 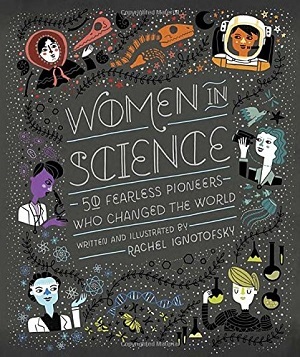 For slightly older children, this beautifully written and put together book features a whole host of scientists (50), most of whom the readership won’t have heard of, but all of whom are inspirational women through the ages from Hypatia (in approx 350 CE) to Maryam Mirzakhani (born in 1977) who have contributed in some way to the world of science. As in Kate Pankhurst’s book, they come from all walks of life, all echelons of society and from all over the world. Each profile is a double page spread, with one page given over to a two-tone illustration of the woman, complete with annotations and a decorated background (on black paper). The other page features a considerable chunk of text, but has illustrated borders with extra quirky facts. The text is easy to read – fascinating and concise biographies that explain motivations and emotions as well as the hard facts of the individual woman’s achievement. The illustrations are striking and distinct – their personalities well-encapsulated from the focussed and rather severe looking Marie Curie to a compassionate and thoughtful Mamie Phipps Clark (psychologist and civil rights activist). None of these women held themselves back – all pushed through barriers to get to where they wanted. There are some incredible stories in here. Rita Levi-Montalcini (neurologist and Italian senator) who was forbidden by the Nazis from practising medicine because of her Jewish faith, so built her own laboratory in her bedroom. Her research led her to win the Nobel Prize in 1986, and she worked until she died aged 103. Patricia Bath, the first African American woman to complete a residency in ophthalmology and obtain a medical patent, who helped restore sight to blind people and invented the Laserphaco Probe. Her mother bought Patricia her first chemistry set. One of the loveliest features of this book is how many biographies there are – and even some more smaller ones squashed in the back – as if saying – there are loads of women scientists out there if you just look. A glossary for scientific terms, and some research sources complete the book. The motivation for the book is clear – to inspire a future generation to aspire. The fact that it is also aesthetically pleasing means that it will be a lasting treasure on any bookshelf. For ages 8+. Definitely buy one here. This week on MinervaReads, two blog posts that take a look at contemporary fiction that mirrors, borrows from, or is inspired by, classic literature. 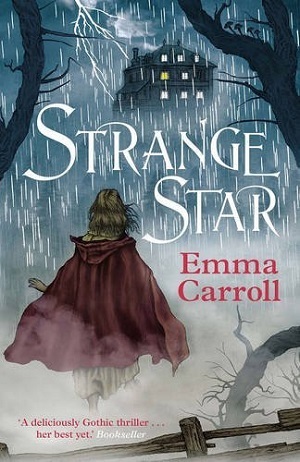 Today, contemporary children’s author, Emma Carroll talks about recent examples of this, following on from the publication this month of her Frankenstein inspired story, Strange Star. To read MinervaReads’ review of Strange Star, click here. Having recently had published a story with its roots in ’Frankenstein’, my view on this subject doesn’t need much explanation. Yes, Strange Star is a nod in the direction of Mary Shelley and her gothic masterpiece- maybe it’s more than a nod (Badges? Banners? I ‘Heart’ Mary t-shirts?). I’m proud to join a long line of writers who’ve been influenced by classics from the past. Reinventing classics is a popular, tried- and tested- genre in adult fiction. From the subtle ‘echo’ of Victorian sensation novels in books such as Fingersmith by Sarah Waters, and The Goddess and the Thief by Essie Fox, to direct ‘spin-offs’ such as Nelly Dean by Alison Case (Wuthering Heights), Jo Baker’s Longbourn (Pride and Prejudice), Mrs De Winter by Susan Hill (Rebecca) and the classic in its own right Wide Sargasso Sea by Jean Rhys (Jane Eyre). There are far too many to list here: suffice to say I’ve a soft spot for a good re-invention. With regard to sequels/prequels/spin-offs certain classics seem to attract more attention. Often it’s because they’re very well known: Wuthering Heights, Jane Eyre, The Moonstone, Pride and Prejudice. Or, rather ambiguous: Rebecca, Wuthering Heights. Or, feature minor characters whose stories are bursting to be told: Lydia Bennett, Bertha Mason, Hindley Earnshaw. I had experience of this myself last year when writing a short educational version of Wuthering Heights for Collins. They requested it be from Heathcliff’s perspective: given his almost psychopathic tendencies in the original, making him age-appropriate was a challenge. I had to give him a motivation. Bronte’s gaps in the story were what triggered my own. Which brings me on to the influence of classics in children’s literature. Many wonderful, hugely popular writers – Robin Stevens, Katherine Rundell, Katherine Woodfine – pay homage to the likes of Frances Hodgson Burnett, E. Nesbit, and Eva Ibbotson in their work. And I can’t go any further without mentioning the spectacular Five Children On the Western Front by Kate Saunders, which is a direct sequel to Five Children and It, and executed with incredible skill. More recently we’ve had Return to the Secret Garden by Holly Webb, my particular favourite, the up and coming Lydia- the Wild Girl of Pride and Prejudice by Natasha Farrant, and yes, my own Strange Star. I speak for myself here, but for me, writing something so directly linked to a classic was a way of exploring my relationship with that book. Frankenstein featured heavily in my teaching years: writing Strange Star helped me move on from that time in my life. The teacher in me still exists: I hope by reading something accessible, young people will go on to seek out the classics, or at the very least be aware of their cultural significance. I’d say all of my books owe something to the classics. It’s not deliberate. Over the years I’ve read many, many books and in that time developed tastes, preferences, interests that have shaped who I am as a writer. You are what you read. Cut me open and you’d probably find a black Penguin Classics spine running through me. With huge thanks to Emma Carroll, one of our most essential and talented contemporary children’s writers. For MinervaReads review of Strange Star, click here. To buy Emma’s latest book Strange Star, please click here.